Manufacturing and supplying of sampling kits, international logistics, central laboratory, treatment and conservation of biological samples. These services are intended for clinical study promoters. Transfer of biological samples for scientific purposes (accredited by French Ministry in charge of research). These services are intended for pharmaceutical industry, diagnostic industry and biotechnology companies. CDL Pharma, created in 2005, is a simplified joint-stock company with a capital of € 37.000. The Alphabio Laboratory is the privileged partner of CDL Pharma for the realization of routine medical analyses. Since the creation of CDL Pharma, our quality system is an important development factor in the realization of our services, in the choice of our suppliers and then for the satisfaction of our clients. 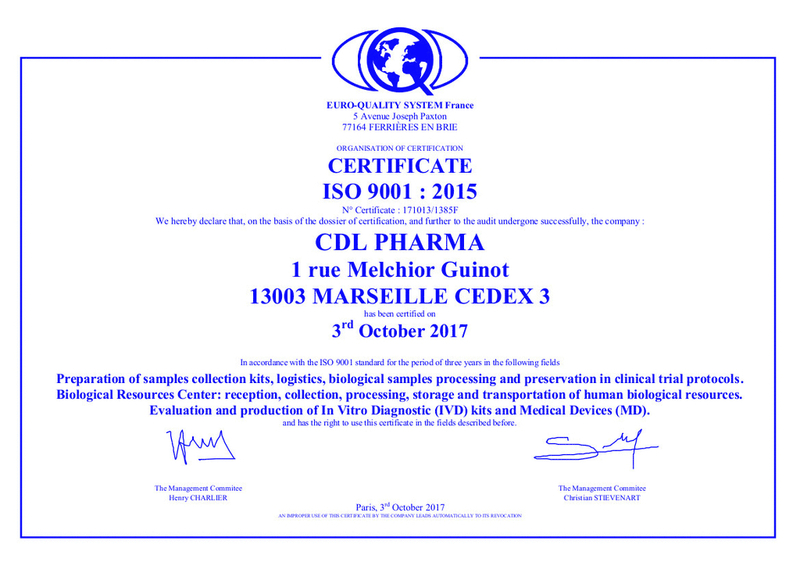 CDL Pharma is certified ISO 9001 V2015 for all its activities. Our quality system also allows us to comply with the regulatory requirements and standards of clinical research (ICH, GCP).